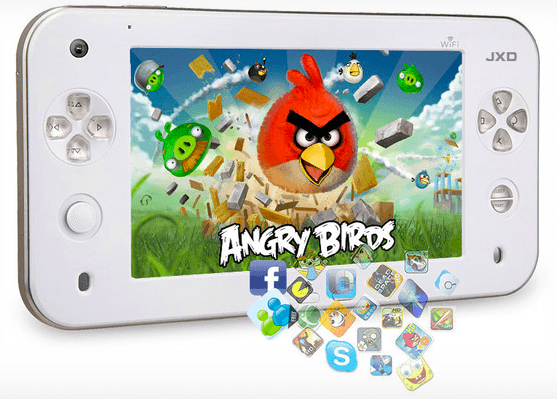 The tablet can play old-school arcade games like Mario Kart 64, as well as as Android goodies like Angry birds and Fruit Ninja. The device also comes with aformentioned Playstation button icons, a D-pad, an 800x480 capitative touchscreen, ARM Cortex A9 CPU, Mali 400 GPY, 512 MB of RAM, 16GB of internal storage and front and back cameras, so you can take pictures of yourself enjoying all the gaming action. The device is relatively inexpensive compared to the retail prices for most high-end Android smartphones these days: it costs just $139.99…but good luck trying to make a phone call on this device. If we've managed to pique your interest, click below to watch a hands-on video with the device, then click the source link to see more slavish copying of Apple, Playstation, Android and everyone in between. Nice, I know one person this will be interesting to.